The Norman invasion of Ireland took place in stages during the late 12th century and led to the Anglo-Normans conquering large swathes of land from the Irish. At the time, Gaelic Ireland was made up of several kingdoms, with a High King claiming lordship over the lesser kings. In May 1169, Anglo-Norman mercenaries landed in Ireland at the request of Diarmait Mac Murchada (Dermot MacMurragh), the ousted King of Leinster, who had sought their help in regaining his kingdom. Diarmait and the Normans seized Leinster within weeks and launched raids into neighbouring kingdoms. This military intervention had the backing of King Henri Court-manteau II and was authorized by Pope Adrian IV. In the summer of 1170 there were two further Norman landings, this time led by the Anglo-Norman Earl of Pembroke, Richard "Strongbow" de Clare. By May 1171, Strongbow had assumed control of Leinster and seized the Norse-Irish city kingdoms of Dublin, Waterford, and Wexford. That summer, High King Ruaidrí Ua Conchobair (Rory O'Connor) led an Irish counteroffensive against the Normans, who nevertheless managed to hold most of their conquered territory. In October 1171, Henri Court-manteau landed with a large army in Ireland to establish control over both the Anglo-Normans and the Irish. The Norman lords handed their conquered territory to Henry. He let Strongbow hold Leinster in fief and declared the cities to be crown land. Many Irish kings also submitted to him, likely in the hope that he would curb Norman expansion. Henry, however, granted the unconquered kingdom of Meath to Hugh de Lacy. After Henry's departure in 1172, Norman expansion and Irish counteroffensives continued. The 1175 Treaty of Windsor acknowledged Henry as overlord of the conquered territory and Ruaidrí as overlord of the rest of Ireland, with Ruaidrí also swearing fealty to Henry. However, the Treaty soon fell apart; the Anglo-Norman lords continued to invade Irish kingdoms and they attacked the Normans in turn. In 1177, Henry adopted a new policy. He declared his son John to be "Lord of Ireland" (i.e. of the whole country) and authorized the Norman lords to conquer more land. The territory they held became the Lordship of Ireland and formed part of the Angevin Empire. The largely successful nature of the invasion has been attributed to a number of factors. These include the Normans' military superiority and castle-building; the lack of a unified opposition from the Irish; and the support of the Roman Catholic Church for Henry's intervention. 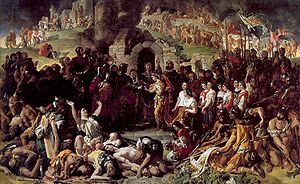 The Norman invasion was a watershed in the history of Ireland, marking the beginning of more than 800 years of direct English and, later, British involvement in Ireland. In the 12th century, Gaelic Ireland was made up of several over-kingdoms, which each comprised several lesser kingdoms. At the top was the High King, who received tribute from the other kings but did not rule Ireland as a unitary state. The five port towns of Dublin, Wexford, Waterford, Cork, and Limerick were inhabited by the Norse-Irish and had their own rulers. The Normans conquered England between 1066 and 1075, with all earldoms after held by Normans, as were all bishoprics after 1096, in parallel the Treaty of Abernethy created a limited settlement between the Norman conquers and Scotland, with lands in Cumbria exchanged for peace. Over the following decades, Norman lords conquered much of south Wales and established their own semi-independent lordships there. According to historian John Gillingham, after the Norman conquest, an imperialist attitude emerged among England's new elite, and they came to view their Celtic neighbours as inferior and barbarous. In September 1155, King Henry Curtmantle held a council at Winchester. According to Robert of Torigni, Henry discussed plans to invade Ireland and grant it to his brother William FitzEmpress. However, the plans were put on hold, allegedly due to opposition from his mother, the Empress Matilda. Some of the initiative for invasion may have come from Anglo-Norman church leaders – especially Theobald, Archbishop of Canterbury – who wanted to control the Irish church. That same year, Pope Adrian IV (the only English pope) issued the papal bull Laudabiliter, which authorized Henry to conquer Ireland as a means of promoting the Gregorian Reforms in the Irish church. Irish church leaders had legislated for reform, notably at the synods of Cashel (1101), Ráth Breasail (1111) and Kells (1152). However, implementing the reforms was slow and difficult. It "would demand the abandonment of features of Gaelic society going back to pre-Christian times and of practises which had been accepted for centuries by the church in Ireland." These included attitudes towards marriage, clerical celibacy, the sacramental system, and control of church lands. John of Salisbury, Secretary to the Archbishop of Canterbury, spoke in Rome about the "barbaric and impious" people of Ireland. In 1149, influential French abbot Bernard of Clairvaux had written a book about Saint Malachy, in which he described Ireland as barbaric and semi-pagan. According to historian F. X. Martin, Ireland was "barbaric" in Bernard's eyes simply because it "had retained its own culture and had remained outside the Latin secular world". John and Bernard's depiction of Ireland, rather than the truth about its reforms, became established throughout Europe. In 1166, Diarmait Mac Murchada (Dermot MacMurragh) was ousted as king of Leinster by a coalition led by the High King, Ruaidrí Ua Conchobair (Rory O'Connor), and the King of Breffny, Tigernán Ua Ruairc (Tiernan O'Rourke). However, he was allowed to remain chief of his home territory, Uí Ceinnselaig (Hy-Kinsellagh). Diarmait fled Ireland and sought help from Henry II in regaining the kingship of Leinster. Henry gave Diarmait permission to recruit mercenaries and authorized his subjects to help Diarmait. In return, Diarmait was required to swear loyalty to Henry. Several Marcher Lords agreed to help: Richard de Clare (also known as Strongbow), Robert FitzStephen, Maurice FitzGerald, and Maurice de Prendergast. Diarmait promised Strongbow his daughter Aoífe in marriage and the kingship of Leinster upon Diarmait's death. He promised Robert and Maurice the town of Wexford and two neighbouring cantreds. Under Irish law, Diarmait had no right to do this. Having secured their help, he returned to Uí Ceinnselaig in 1167 and awaited the arrival of the mercenaries. On 1 May 1169, Robert FitzStephen and Maurice de Prendergast landed at Bannow Bay, on the south coast of Leinster, with a force of at least 40 knights, 60 men-at-arms and 360 archers. This force merged with about 500 men led by Diarmait. They set about conquering Leinster and the territories Diarmait had claimed sovereignty over. 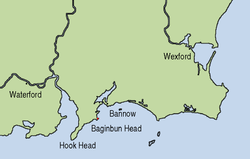 First they besieged the Norse-Irish seaport of Wexford, which surrendered after two days. They then raided and plundered the territories of north Leinster, which had refused to submit to Diarmait. They also raided the neighbouring kingdom of Ossory, defeating the forces of king Donnchad Mac Gilla Patraic (Donagh MacGillapatrick) in the battle of Achad Úr. However, Donnchad withdrew his forces to safety and remained defiant. In response, High King Ruaidrí led an army into Leinster to confront Diarmait and the Normans. The army included contingents from Connacht, Breffny, Meath, and Dublin, each led by their respective kings. 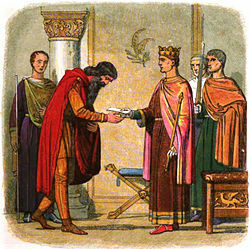 An agreement was reached at Ferns: Diarmait was acknowledged as king of Leinster, in return for acknowledging Ruaidrí as his overlord and agreeing to send his foreign allies away permanently. To ensure compliance, Diarmait agreed to give Ruaidrí hostages, one of whom was his son. However, Diarmait apparently sought to use his Anglo-Norman allies to make himself High King. Shortly after the Ferns agreement, Maurice FitzGerald landed at Wexford with at least 10 knights, 30 mounted archers and 100 foot archers. In a show of strength, Maurice and Diarmait marched an army north and laid waste to the hinterland of Dublin. 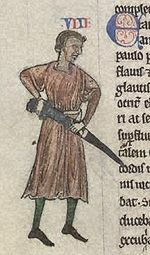 By 1170, Strongbow appears to have been funded financially for his invasion by a Jewish merchant by the name of Josce of Gloucester: "Josce, Jew of Gloucester, owes 100 shillings for an amerciament for the moneys which he lent to those who against the king's prohibition went over to Ireland." In May of that year, Raymond FitzGerald landed at Bannow Bay with at least 10 knights and 70 archers. This was the advance guard for Strongbow's army and was to be the springboard for an assault on Waterford. Raymond's force occupied an old promontory fort at Baginbun and plundered the surrounding countryside. They were then besieged by a much larger force of Irish and Norse. The outnumbered Anglo-Normans drove a large herd of cattle into the opposing army. In the ensuing havoc, the Normans routed the besiegers, killing up to 500 and capturing 70. These captives were then executed: the Normans broke their limbs before beheading them and throwing their bodies off the cliff. On 23 August, Strongbow landed at Passage with at least 200 knights and 1,000 soldiers. They met with Raymond's force and assaulted Waterford. The walls were eventually breached and there followed fierce fighting in the streets, in which 700 defenders were killed. Diarmait and the other Norman commanders arrived in Waterford and there Strongbow married Diarmait's daughter, Aífe. 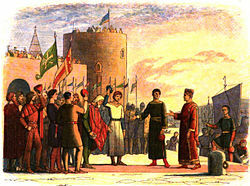 The Normans and Diarmait held a council of war at Waterford and agreed to take Dublin. High King Ruaidrí deployed a large army near Dublin to intercept them. As well as soldiers from Connacht, it included troops from Breffny (led by King Tigernán), Meath (led by King Máel Sechlainn), and Oriel (led by King Murchad Ua Cerbaill). The Normans and Diarmait bypassed them by travelling over the Wicklow Mountains, forcing Ruaidrí's army to abandon their plans. When they reached Dublin, Diarmait began negotiations with its king, Ascall mac Ragnaill (Ascall MacRannall). On 21 September, while talks were ongoing, a force of Normans—led by Miles de Cogan and Raymond FitzGerald—stormed the town and took it. Ascall and his followers fled in their ships but vowed to re-take the town. Strongbow and Diarmait then launched "a devastating campaign" through Meath and into Breffny, burning Clonard, Kells, and several other monastic towns. In response to these violations of the Ferns agreement, Ruaidrí executed three hostages, including Diarmait's son. Diarmait returned to Ferns and died there suddenly in May 1171. Strongbow thus declared himself king of Leinster. However, he had no right to do this under Gaelic law and he was opposed by Diarmait's brother Murchad. Shortly after Diarmait's death, the Anglo-Normans faced a general rising, both from within Leinster and from outside. The Irish of Desmond launched a devastating attack on Norman-held Waterford. At about the same time, a Norse-Gaelic army, in a fleet of at least 60 ships, landed outside Dublin. Led by Ascall, they tried to re-take the town, but were repulsed by de Cogan's forces. Ascall was captured and publicly executed. A great army, led by Ruaidrí, surrounded Dublin. It comprised troops from most of the Irish kingdoms: contingents from Connacht, Breffny (led by King Tigernán), Meath (led by King Máel Sechlainn), Thomond (led by King Domnall Ua Briain), Oriel (led by King Murchad Ua Cerbaill), Ulster (led by King Magnus Mac Duinnsléibe), and Leinster (led by Murchad Mac Murchada). A Norse-Gaelic fleet of 30 ships, sent by Godred Olafsson, blockaded Dublin bay. Robert FitzStephen sent his best troops out of Wexford to help the Anglo-Norman garrison in Dublin. The remaining garrison in Wexford was then attacked and forced out of the town. The Normans fled to a military encampment at nearby Carrick, where they were besieged. The siege of Dublin went on for two months. There were several skirmishes, but the Irish were apparently content to starve out the Normans. With Dublin and Carrick under siege, Strongbow and his council agreed to negotiate. Strongbow proposed that if the Anglo-Normans be allowed to keep what they had conquered, they would acknowledge Ruaidrí as their overlord. Ruaidrí responded that he would only allow the Normans to keep Dublin, Wexford, and Waterford. This was unacceptable to Strongbow. A Norman sortie slipped out of Dublin and made a surprise attack on Ruaidrí's camp at Castleknock. The Normans killed hundreds of soldiers, many of whom were resting or bathing, and seized supplies. Following this defeat, the Irish army withdrew. In the meantime, FitzStephen had surrendered to the Norse-Irish at Carrick. When they learned that Strongbow was on his way, they burnt Wexford and withdrew to a nearby island with FitzStephen as a hostage. By September 1171, King Henry had decided to lead a military expedition to Ireland. He wanted to establish his control over both the Norman warlords and the Irish. Henry apparently feared that Strongbow would set up an independent kingdom in Ireland, but Strongbow's actions were merely a catalyst for Henry's invasion. Historian Peter Crooks writes that, "No less than his predecessors, Henry II was happy to add Ireland to his empire." Henry, as William of Newburgh put it, wanted to have "the glory of such a famous conquest" and its proceeds for himself. On 17 October 1171, King Henry landed at Waterford with a large army of at least 500 mounted knights and 4,000 men-at-arms and archers. Several siege towers were also shipped over. This was the first time since Sitric Cáech that a King of England had set foot on Irish soil, and marked the beginning of Angevin, Plantagenet, Tudor, Stuart, Orange-Nassau, Hanoverian, and later British rule in Ireland. The Norman warlords affirmed their loyalty to Henry and handed over the territory they had conquered to him. He let Strongbow hold Leinster in fief and declared Dublin, Wexford and Waterford to be crown land. Fifteen Irish kings and chiefs submitted to Henry, likely in the hope that he would curb unprovoked Norman expansion into their territories. Those who did not submit included Ruaidrí (the High King and king of Connacht) and the kings of Meath and the Northern Uí Néill. The Annals of Tigernach state that the kings' submissions to Henry II was in two stages; firstly in Waterford by the king of Desmond, and then in Dublin by the kings of Leinster, Meath, Breifne, Airgíalla and Ulster. Henry granted Meath to Hugh de Lacy; meaning that Henry would let de Lacy hold it if he could conquer it. In early 1172, Henry allowed de Lacy to take royal troops into Meath, where they plundered and burned the monastic towns of Fore and Killeigh. Henry also made Dublin available for the freemen of Bristol to colonize. Many of the Norse-Irish inhabitants were forced to re-settle outside the walls, at what became Oxmantown. The Irish church hierarchy also submitted to Henry, believing his intervention would bring greater political stability. Henry "used the church as a vehicle of conquest". He organized the synod of Cashel, at which Irish church practices were brought into line with those of England, and new monastic communities and military orders (such as the Templars) were introduced into Ireland. Pope Adrian's successor, Pope Alexander III, then ratified the Laudabiliter and gave Henry dominion over the "barbarous nation" of Ireland to ensure that its church be brought into line and the Irish would pay their tax to Rome. Henry left Ireland on 17 April 1172, setting sail from Wexford. Some English writers – such as William of Canterbury and Ralph Niger – condemned Henry's military intervention, describing it as an unlawful "hostile invasion" and "conquest". A poem in the Welsh Black Book of Carmarthen describes Henry "crossing the salt sea to invade the peaceful homesteads of Ireland", causing "war and confusion". Gerald de Barri felt obliged to refute what he called the "vociferous complaints that the kings of England hold Ireland unlawfully". Shortly after Henry left Ireland, Hugh de Lacy invaded Meath and was confronted by Tigernán Ua Ruairc. The two leaders met on the Hill of Ward for negotiations. During these negotiations, there was a dispute, and de Lacy's men killed Ua Ruairc. His head was then impaled over the gate of Dublin Castle. Strongbow also invaded and plundered Offaly, but failed to subdue it. In early 1173, many of the Anglo-Norman leaders left Ireland to fight for King Henry in the Revolt of 1173–74. When Raymond FitzGerald returned later that year, he led a successful plundering raid into the kingdom of the Déisi, by both land and sea. However, as their king had submitted to Henry, the kingdom should have been exempt from attack. The Norman raid on the monastic town of Lismore was interrupted by a Norse-Irish fleet from Cork. After a naval engagement, the Normans withdrew to Waterford. FitzGerald then returned to Wales, due to the death of his father. In late 1173, Diarmait Mac Murchada's son, Domhnall Caomhánach (Donal Cavanagh), attacked Strongbow's forces in Leinster, killing 200 soldiers. Around the same time, an Irish army from Thomond and Connacht, led by Domnall Ua Briain (Donal O'Brian), forced the Normans out of Kilkenny and destroyed Strongbow's motte-and-bailey castle there. Strongbow responded in early 1174 by marching an army into Thomond and advancing towards Limerick. At Thurles, Domnall Ua Briain's forces defeated a contingent of Strongbow's army, killing hundreds and forcing him to abandon the march to Limerick. Norman power in Ireland seemed to be disintegrating, and in the words of Gerald de Barri, "the entire population of Ireland took the opportunity of this disorder to rise with one consent against the English". Shortly after the Norman defeat at Thurles, the Norse-Irish of Waterford rose up and killed the Norman garrison of 200 soldiers. Ruaidrí gathered an army that included contingents from Connacht, Meath, Breffny, Oriel, Ulster, and the Northern Uí Néill, along with their kings. It marched into Meath, destroying the castles at Trim and Duleek, before advancing on Dublin. Raymond FitzGerald landed at Wexford with at least 30 knights, 100 mounted soldiers and 300 archers. When this army arrived at Dublin and reinforced the garrison there, Ruaidrí's army withdrew. In 1175, the Anglo-Normans rebuilt their castles in Meath and raided or "laid waste" the province from Athlone in the west to Drogheda in the east. They also hanged the Irish king of Meath, Magnus Ua Máel Sechlainn (Manus O'Melaghlin). On 6 October 1175, Henry II of England and High King Ruaidrí agreed to the Treaty of Windsor. The treaty divided Ireland into two spheres of influence: Henry was acknowledged as overlord of the Norman-held territory, and Ruaidrí was acknowledged as overlord of the rest of Ireland. Ruaidrí also swore fealty to Henry and agreed to pay him a yearly tribute in cow hides, which Ruaidrí could levy from throughout his kingdom. A Connacht-based annalist reported the treaty in triumphal terms: "Cadla Ua Dubthaig [archbishop of Tuam] came out of England from [Henry] the son of the Empress, having with him the peace of Ireland, and the kingship thereof, both Foreigner and Gael, to Ruaidrí Ua Conchobair". However, the Windsor Treaty soon fell apart. Henry was "unable or unwilling" to rein in the Anglo-Norman lords, and Ruaidrí was unable to control all of the Irish kings. Contemporary English historian William of Newburgh wrote that "the military commanders left there by him [Henry] for the government of this subjugated province, desirous either of booty or fame, by degrees extended the boundaries allotted to them". In April 1176, a large Anglo-Norman army from Dublin marched north into what is now County Armagh. This was part of Oriel, a kingdom meant to be free from enroachment under the treaty. However, the Irish of Oriel forced the Anglo-Normans to retreat and killed up to 500 of their soldiers. That summer, the forces of Oriel and the Northern Uí Néill (under Cenél nEógain (Kinel Owen)) invaded Meath, led by King Mael Sechlainn Mac Lochlainn. They destroyed the castle at Slane and forced the Anglo-Normans to abandon Galtrim, Kells, and Derrypatrick. Strongbow died in May 1176, and Henry appointed William FitzAldelm as his new representative in Ireland. He was replaced the following year by Hugh de Lacy. In February 1177, John de Courcy left Dublin with a force of about 22 knights and 500 soldiers. De Courcy marched north at speed, into kingdom of Ulaid, and captured the town of Downpatrick. The Ulaid, led by king Ruaidrí Mac Duinnsléibe (Rory MacDunleavy), tried to re-take the town but were repelled after a fierce battle. King Henry held a council at Oxford in May 1177, which marked a change of policy towards Ireland. He declared his son John (aged ten) to be "Lord of Ireland", and made plans for him to become king of all Ireland when he came of age. The territory held by the Anglo-Normans thus became known as the Lordship of Ireland and formed part of the Angevin Empire. Henry also encouraged the Anglo-Norman lords to conquer more territory. He granted the kingdom of Thomond to Philip de Braose and granted Desmond to Robert FitzStephen and Miles de Cogan. Over the following months, the Anglo-Normans invaded the kingdoms of Desmond, Thomond, and Connacht, while John de Courcy continued his conquest of east Ulster. In contemporary or near-contemporary sources, the invaders are overwhelmingly described as English. This was because they were vassals of the king of England, and not because they were culturally Anglo-Saxon. Expugnatio Hibernica almost always describes them as English; so too does The Song of Dermot and the Earl, a source which uses the term "English" about eighty times, whilst using "French", "Flemings", and "Normans" in only one particular line. Despite the modern employment of terms such as "Normans", "Anglo-Normans" (itself an eighteenth-century construct), and "Cambro-Normans", contemporary sources virtually never use "Norman" in an Irish context. Irish sources usually describe the men as "foreigners" and "grey foreigners", or else as Saxain ("Saxons" or "English"). In consequence, it is apparent that contemporaries regarded the incomers as English, despite the fact that they were not exactly such. In the nineteenth century, however, during a period of intense and sensitive political debate, the term was dropped by historians and replaced with ahistorical terms. Even amongst modern historians there is still a reluctance to use "English". ^ Campbell, Kenneth L. (2013). Ireland's History: Prehistory to the Present. A & C Black. p. 59. ^ Gillingham, John (2000). The English in the Twelfth Century. Boydell & Brewer Ltd. pp. 42–43, 145. ^ Duffy, Seán (2007). "Henry II and England's Insular Neighbours". In Christopher Harper-Bill (ed.). Henry II: New Interpretations. Boydell Press. pp. 132–133. ^ Crooks, Peter (2005). "Anglo-Irish Relations". In Seán Duffy (ed.). Medieval Ireland: An Encyclopedia. Routledge. p. 27. ^ a b c d Carpenter, David (2003). The Struggle for Mastery: Britain 1066–1284. Oxford University Press. pp. 218–219. ^ Austin Lane Poole. From Domesday book to Magna Carta, 1087–1216. Oxford University Press 1993. pp. 303–304. ^ Ranelagh, John (1994). A Short History of Ireland. Cambridge University Press. p. 36. ^ Kearney, Hugh (2012). The British Isles: A History of Four Nations. Cambridge University Press. p. 117. ^ Curtis, Edmund (2013). A History of Ireland: From the Earliest Times to 1922. Routledge. p. 64. ^ a b Duffy, Seán (2007). "Henry II and England's Insular Neighbours". In Christopher Harper-Bill (ed.). Henry II: New Interpretations. Boydell Press. p. 138. ^ Doran, Linda (2007). Lordship in Medieval Ireland: Image and Reality. Four Courts Press. p. 165. ^ a b Daniell, Christopher (2013). From Norman Conquest to Magna Carta: England 1066–1215. Routledge. pp. 65–66. ^ Hull, Eleanor. "POPE ADRIAN'S BULL "LAUDABILITER" AND NOTE UPON IT", from A History of Ireland and Her People (1931). ^ a b Perros, Helen (1995). "Crossing the Shannon Frontier: Connacht and the Anglo-Normans". In T. B. Barry (ed.). Colony & Frontier in Medieval Ireland. A&C Black. pp. 118–119. ^ Ó Cróinín, Dáibhí (2013). Early Medieval Ireland, 400–1200. Routledge. p. 289. ^ Duffy, Seán (2003). "John and Ireland". In S. D. Church (ed.). King John: New Interpretations. Boydell & Brewer. pp. 225–227. ^ Bartlett (2010) p. 34; Flanagan (2005) pp. 17–18; Gillingham (2000) pp. 151–153. ^ Gillingham (2000) pp. 151–154. ^ a b Bartlett (2010) p. 34; Flanagan (2005) pp. 17–18; Gillingham (2000) pp. 151–155, 152 n. 36. ^ Bartlett (2010) p. 34; Gillingham (2000) p. vx. ^ Bartlett (2010) p. 34; Flanagan (2005) pp. 17–18; Gillingham (2000) pp. 152–153. ^ Flanagan (2005) pp. 17–18; Gillingham (2000) pp. 152–153. ^ Bartlett (2010) p. 34; Gillingham (2000) p. 153. ^ Gillingham (2000) pp. 153 n. 45, 157–158, 157 n. 62. Martin, Francis Xavier (2008). "Chapter 2: Diarmait Mac Murchada and the coming of the Anglo-Normans". In Art Cosgrove (ed.). A New History of Ireland, Volume II: Medieval Ireland 1169–1534. Oxford University Press. Martin, Francis Xavier (2008). "Chapter 3: Allies and an overlord, 1169–72". In Art Cosgrove (ed.). A New History of Ireland, Volume II: Medieval Ireland 1169–1534. Oxford University Press. Martin, Francis Xavier (2008). "Chapter 4: Overlord becomes feudal lord, 1172–85". In Art Cosgrove (ed.). A New History of Ireland, Volume II: Medieval Ireland 1169–1534. Oxford University Press. Bartlett, Thomas (2010). Ireland: A History. Cambridge: Cambridge University Press. ISBN 978-0-521-19720-5 – via Google Books. Flanagan, Marie Therese (2005). "Anglo-Norman Invasion". In Duffy, S (ed.). Medieval Ireland: An Encyclopedia. New York: Routledge. pp. 17–19. ISBN 0-415-94052-4. Gillingham, J (2000). The English in the Twelfth Century: Imperialism, National Identity, and Political Values. The Boydell Press. ISBN 0-85115-732-7. This page was last edited on 19 April 2019, at 12:43 (UTC).